International waste-to-product business, Shanks Group plc has accepted the first waste into its waste treatment facility in Rotherham, part of a £750m contract with Barnsley, Doncaster and Rotherham Councils. The development at Brookfield's Park is designed to create material suitable for recovery and recycling and includes Mechanical Biological Treatment (MBT) and Anaerobic Digestion (AD) facilities. The three councils secured £77m through the Private Finance Initiative for the scheme and Shanks Group plc, one of Europe's leading waste management businesses, joined in partnership with SSE (Scottish and Southern Energy plc) to progress the plans. Known as 3SE, the operators signed a 25 year contract worth in excess of £750m with the councils for the treatment of black bag waste. Constructed by Balfour Beatty, more than 40 new jobs have been created at the Dearne Valley operation. Waste from all three councils will start being delivered to the facility at Bolton Road at the rate of approximately 200 tonnes a day. Over the next few weeks, deliveries will increase to around 1,000 tonnes a day. Over the next 25 years, up to 250,000 tonnes of leftover waste a year from 340,000 households will be treated. Operators believe that once the facility is fully operational in July, it will divert 98% of waste from landfill and will save 114,000 tonnes of CO2 every year. During processing, the waste will be turned into recycled products, green energy, a nutrient-rich digestate and Refuse Derived Fuel (RDF). Under the contract, SSE will take around half of the RDF produced at Manvers to generate low carbon electricity at its new multifuel facility (known as FM1) in Ferrybridge. FM1 is scheduled to accept its first fuel next month and is expected to be fully operational later this year. 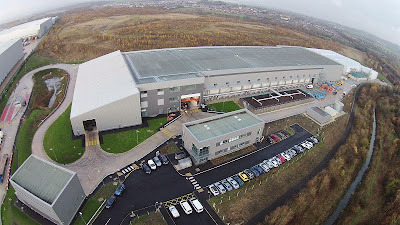 Peter Eglinton, managing director of Shanks' UK Municipal Division, said: "As a leading waste-to-product company, we are delighted to be accepting first waste at our BDR facility in Rotherham. "The facility will help to make more from the waste produced in the area by increasing recycling, generating green energy and producing compost for land remediation. We look forward to continuing to work with the authorities and local residents to increase their diversion from landfill using this genuinely sustainable solution."